It would be slightly embarrassing if I admitted right here and now that until this sweet corn salad, I hadn’t eaten a radish since I was six and pulled one out of my neighbor’s garden, illegally, downing it in one bite thinking it was a sweet, red, bulbous carrot or some type of firm, sweet cherry tomato (dude, I was six, cut me a break). I was scarred for a long time. And so was my esophagus after the peppery, spicy radish made it’s hurried descent before the neighbor or my mom caught me. Needless to say, that ended my garden pilfering and radish eating career immediately. But when my friend Liz who has fabulous taste in food sent me this salad raving about how she’s eaten it for days straight, I decided to act my age and tackle my radish-phobia. I can’t sleep at night knowing my friends are eating crazy, delicious food and I can’t get in on the action. I’ll tell you this, I probably won’t be digging up radishes and eating them for sheer pleasure, but in this salad? They are magic. Thinly sliced and paired with the luscious sweet corn, tangy lime juice, fresh cilantro and faintly spicy jalapeno, they are fabulously crunchy and peppery and perfect. And speaking of perfect, so is this simple, summer salad. 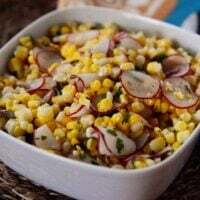 Get your hands on some sweet corn and radishes (just not from your neighbor’s garden) and make it. Devour it. Love it. As a reluctant radish eater, I understand. It isn’t until recently I’ve found they do indeed have a place in this world (in certain salads or pickled). I enjoyed this salad and felt that since it doesn’t have cheese, its a good healthy alternative to some corn salads. But if we are getting down to it I would have to say your Mexican Tomato & Corn Salad is my fave between the two and the one I’ll be remaking again and again! My husband has made this twice while I’ve been on pregnancy bed rest…I have major food aversions and nothing appeals to me or stays down, but this was so delicious. I ate a whole bowl of it. Cut thin the radishes are not overpowering at all. I’m commenting now because I’m thinking about this yummy salad. Thanks for the awesome recipes, Mel! I love radishes too. They are the very first veggie I search for every Spring. Try them with salt and a smear of butter. Delicious! I am a radish lover, and can eat them as a snack just as they are! I have never thought to pair them with sweet corn. I will be very excited to try this! What’s the trick to getting those radishes so thin and perfect? It looks lovely. Maureen – I used my mandolin but I’ve also used the side of my box grater that has the wide, flat slicers. That sounds awesome, I want to make it tonight! Too bad the people around me this week don’t love cilantro as much as I do, it might have to wait a bit – unless I want to eat all of it myself! 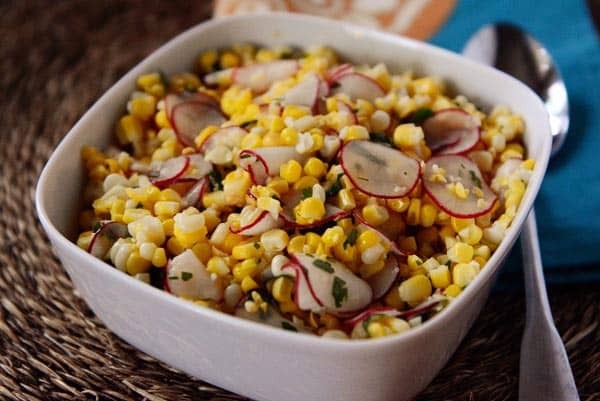 Sounds wonderful, corn, radish, cilantro and jalapeno – gotta try it! I’ve been working on liking radishes (I want to, but I really don’t), so I think this might be the recipe for me! I am totally trusting you right now. When I saw the picture I thought I would just leave out the radishes, but now I’m thinking they need a chance.